Art supplies and tea on right side of table & sketchbook, ink & watercolor, 4x6"
These are some of my special drawing table items: my cigar box supply holder, my watercolor brushes and pens, and a coaster under my cup sent to me by illustrator Mick Wiggins in response to a fan letter I sent him about the series of posters he designed for BART, our subway system. 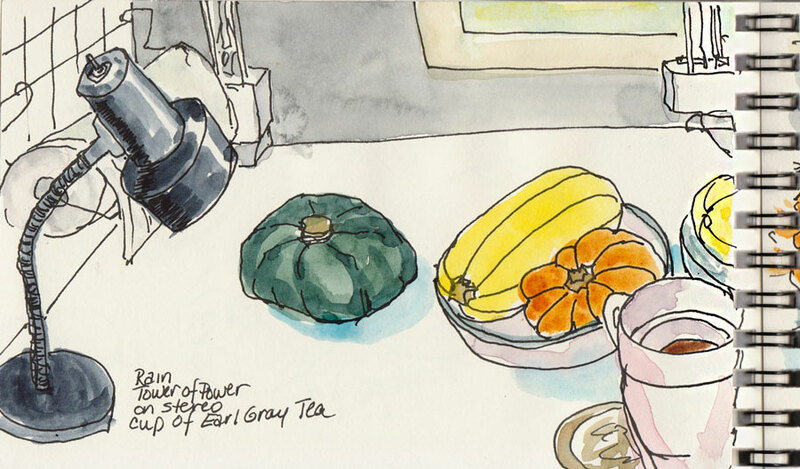 Lamp and squash on right side of table & sketchbook, ink & watercolor, 4x6"
And here’s the left side of the same drawing table with my funky little table lamp for lighting still lifes, the wall grid for hanging supplies with paper towel holder, and the base of two combo lamps at the back — and some squash for sketching that are still (a month later) awaiting cooking. Table still life, full spread in sketchbook, 4x12"
Here’s the full spread as it appears in the sketchbook. I drew the cup twice because I wanted to practice ellipses. I feel a little sad looking at the pictures because that much loved studio is no more. It’s under construction to become a studio apartment instead. 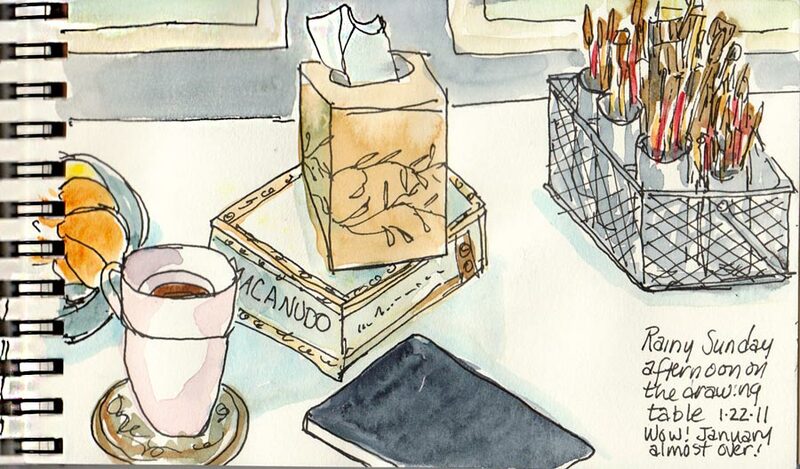 Great post, Jana; love the peeks and the sketches and can’t wait to see some of and/or from the new studio. I hope the chaos subsides soon! :)). It looks like the same one that Cathy McAuliffe uses for the SF Urban Sketchers and I’ve been trying to figure out what it is. I’m having such trouble finding one I like…. Right you are Sarah. Our whole Urban Sketchers group is using these for group projects. Cathy bought them and designed labels for them for our “Every day in January” project and now we’re using them for “Monochrome March.” They are great little sketchbooks: Strathmore 400 Drawingin size 4×6. They hold a light wash and hardly buckle at all. The 4×6 size fits easy in a purse and is heavy enough you can draw on both sides of a sheet. And they only cost $2 each. I used to use the larger size of this as my regular sketchbook and had no complaints but experimented with Moleskines, Aquabee Super Deluxe, and others, and then started binding my own. I’ve been so busy lately that I haven’t been binding, and just using commercial ones. Thank you, Jana, for the sketchbook info. This may be the ONE!! And your lovely, lively sketch of your desk inspired me to try one, too. Thanks! sounds good…know you’ll be happy to be settled again! great sketches! That is very cool looking – the panoramic type shape is so interesting and the way you didn’t let the spiral binding interfere makes the whole thing look so good. I recently painted a giant Sequoia on a 6×18″ canvas, and it is just a neato shape. A subwoofer!? That’s one of those speaker things that rattles the windows, right? Nice! Can’t wait to see sketches of your new place!!! I’ll bet once you’re in you won’t look back! These are very special sketches and will be wonderful reminders in the future. Enjoy your new space. I know you will appreciate it! Love. Love. Love. You have such a deft and concise, assured hand with your sketch lines, Jana. And to do so much in such a small page- Brava!! I am looking forward to breaking in my Fabriano book, but I want to practice on something “lesser” first. This strathmore might be just right. I love your blog! I LOVE the “Journal Abuse” thought! You know, I try to take such meticulous care of everything. You may have noticed I even have the tray on my easel covered with contac paper! I am going to really loosen up and get wild(er)! 🙂 Hopefully will have something to show you by weeks end. Thanks so much for your insights and suggestions. I love your journal! Whilst this was a lovely studio space, I’m sure the new one will be far, far better.